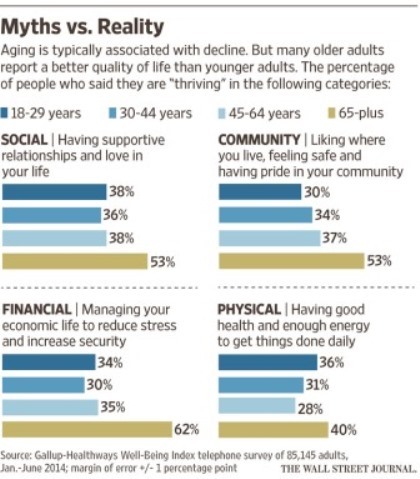 The Wall Street Journal has a very good article on aging, titled, “To Age Well, Change How You Feel About Aging“. While some of it is, okay, just common sense, a good portion is really thought stimulating. In test after test, researchers are finding that if we think about getting older in terms of decline or disability, our health likely will suffer. If, on the other hand, we see aging in terms of opportunity and growth, our bodies respond in kind. 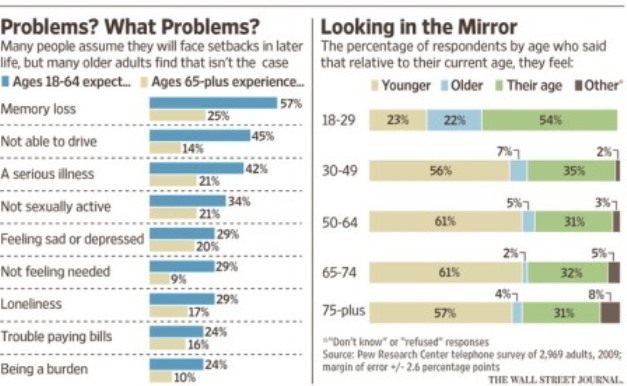 One of the problems facing folks, as they age, is the plethora of negative stereotypes about aging in our society. Elders and those approaching that status actually have to resist allowing those stereotypes to bring them down, mentally, to avoid negative consequences, physically. For much more on this topic, click on the WSJ story link at the top.